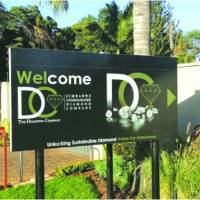 STATE diamond mining entity, Zimbabwe Consolidated Diamond Company (ZCDC), will invest $400 million under its vision 2025 plan as part of efforts to meet set production target of at least 10 million carats (2 tonnes) a year in the next four years. Addressing the media at the unveiling of the reconstituted seven member ZCDC board, which is now under the chairmanship of engineer Killiam Ukama, Mines and Mining Development Minister Winston Chitando said ZCDC will be expected to produce at least 10 million carats of the precious stones by 2023. This is against the background that the firm only managed 0,9 million carats in 2016, which it then bettered to 1,8 million in 2017 and is well on course to meet its 3 million carats target for 2018. “. . . with ZCDC, which produced 1,8million carats last year and in terms of the strategic plan they have, they would want to grow this to at least 10 million carats by the year 2023 and at least 12 million carats by the year 2025,” said Minister Chitando on May 31. “(This) is a massive increase in terms of production, that is as a minimum, but we would want to see more but it is really the board, which will have to work and see what can be done,” he said. In an exclusive interview with this publication, ZCDC chief executive officer Dr Morris Mpofu said an investment of $400 million had been set towards the attainment of this ambitious target. Approximately $200 million, Dr Mpofu said, will be funded through reinvestment from the firm’s diamond sales earnings while the remaining $200 million will be financed through foreign direct investment. The strategy is contained in the state miner’s Diamond Value Management (DVM), which will primarily target exploration – especially in light of the depletion of the easy to mine alluvial deposits – evaluation, mining and diamond processing to unbundle the real value of the diamonds. Resource exploitation will however not be confined at the famed Chiadzwa diamond deposits, but will also target other deposits in Chimanimani as well as known kimberlites in Chihota and Mwenezi. “ZCDC intends to achieve this (10 million carats) milestone through investment of $400 million in exploration and evaluation, mining, processing and DVM,” said Dr Mpofu. “The investment will be funded through reinvested earnings of $200 million and the balance through foreign direct investments. Exploration and evaluation has increased significantly to find new deposits and create sustainable mining plans. “Evaluation of existing resources in Chiadzwa and Chimanimani has also been increased, the upgrading of Inferred to Indicated resources increasing resource confidence levels. Resource expansion projects in evaluation of known kimberlites such as Chihota and Mwenezi pipes will provide additional resources for business growth and sustainability,” he said. As part of its ambitious target, the miner has already invested in a Mega Diamond Recovery (MDR) plant to recover large and high value stones that were previously not incorporated in the previous plant operations resulting in failure to mine out high value stones. The MDR will also be used on the old dump from pre-consolidation mining and could see the recovery of even more larger stones. Dormant portals that had been neglected after the depletion of alluvial deposits among them D, G, J and Q will also be explored and are earmarked for reopening in 2019 under sustainable conglomerate exploitation.